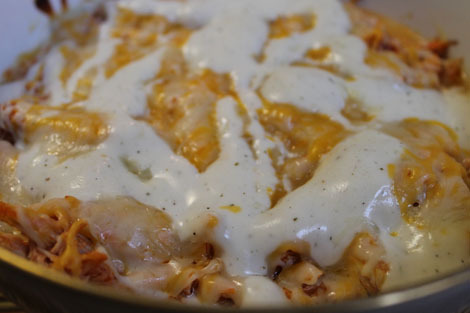 less is more: buffalo chicken dip. YUM, is all I will say to start this off. 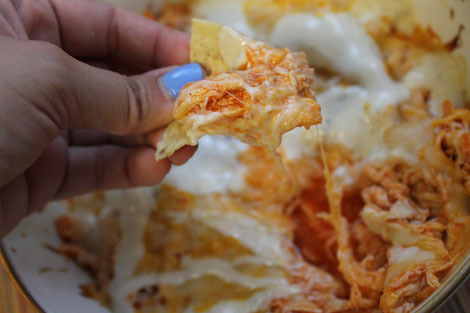 I love buffalo chicken, I love spicy, and I love dips. Win, win, win here with this recipe (adapted from here). 1// poach the chicken [note: I looked up a few different ways to do this, and in the end I combined a few because it was my first time doing it. Boil water in a pot, put chicken breasts cut in half in the water, immediately turn heat down to low, let chicken simmer for 25 minutes or until cooked through]. 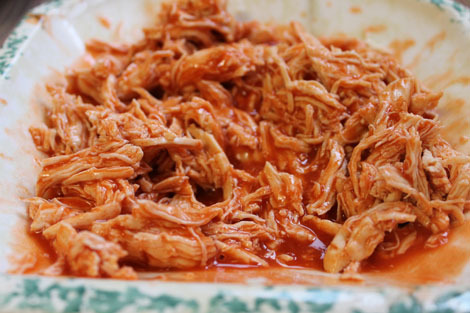 2// shred the chicken into bits and soak in the hot sauce. 3// spread the cream cheese on the bottom of a casserole dish. 4// add soaked chicken on top, followed by the cheese and the drizzled dressing. 5// bake on 350*F for 20 minutes, then broil for 2-3 minutes to crisp up the cheese on the top. 6// serve with chips, celery, bread bits, or a spoon.